Canning is addictive. 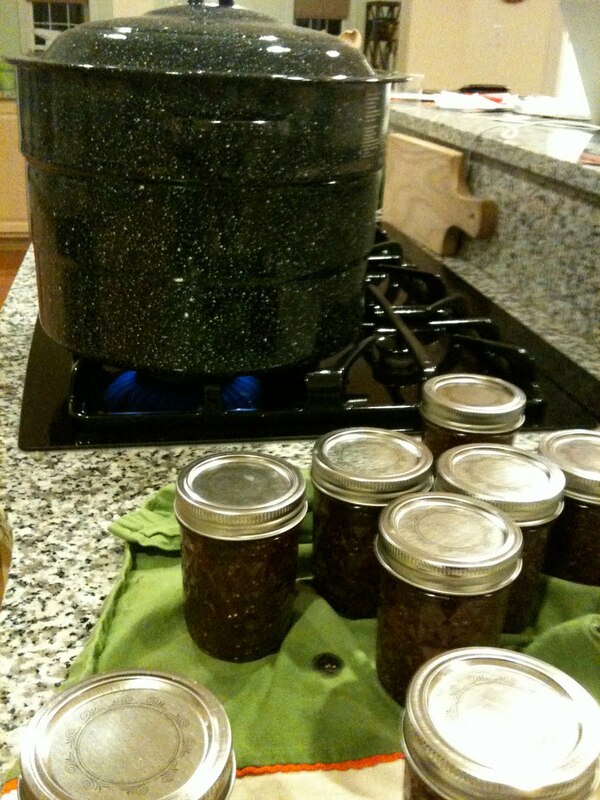 Canning is not hard or frightening. It is economical, fun, and best of all, allows us to eat foods with as much sugar as candy while telling ourselves it’s nutritious. After consuming gobs of apricot refrigerator jam, we were ready to go for the real thing. Being somewhat of a compulsive fruit buyer, I quickly acquired 2 lbs. of fresh figs, 2 quarts of strawberries, a quart of raspberries, and 3 lbs. of kiwis. Thanks to Wegmans, I also obtained a hot water bath canner , jars, tongs, and pectin. You can purchase canning items online, at Walmart, or at local hardware stores. Using Yvonne Tremblay’s 250 Home Preserving Favorites , we put up 8 jars of kiwi raspberry jam and 8 jars of strawberry fig balsamic jam. The balsamic adds a certain je ne sais quoi. While it is not difficult, there are a few alarming aspects to canning (other than the potentially deadly threat of botulin toxin). The first is the amount of sugar in jam. Recipes advise not to reduce the sugar, lest the jam fail to set properly. I reduced the sugar in both recipes, and the jam set perfectly. Four cups of fruit to seven cups of sugar was just more of a buzz than I could handle. No one would know the difference. You can purchase pectin for low-sugar recipes, although I have yet to try this. The second most vexing aspect was the large cauldron of boiling water. I read in one book that small children should be kept at a distance when canning. Sugar plus fruit plus boil, boil and toil equals trouble. So we did the canning late into the night, which added to the whole mystique. Just to be safe, we sterilized our pint-size jars in the cauldron for 10 minutes, prior to filling them with jam. This is the safest method to ensure sterilization. Some people use the dishwasher, but most dishwashers do not reach high enough temperatures to ensure complete safety. During the jam session with my friend, however, I learned to pour hot water from a tea kettle into each jar and let them sit while the jam cooks. This is a good option when making multiple quart-size batches of jam, especially when you are on the short side and a little clumsy. Filling the jars with boiling water from a tea kettle proved easier than reaching into the cauldron and using tongs to remove and empty quart-size glass jars filled with boiling hot water. After filling the hot jars with the mixture of hot fruit and sugar, we put the lids on and submerged them in the hot water bath for another 10 minutes, assuring that all bacteria are killed and the lids are sealed. Voila! We now have lots of holiday gifts and endless fresh jam for those cold, fruitless winter days. It’s fun and convenient to can seasonal, store-bought fruit. One of the most important aspects of canning is using fresh, ripe fruit. Ideally, the canning officionado seeks to grow or pick her own. We have a small blue-berry bush, but it hasn’t borne enough fruit to can. Picking is a fun family activity and reinforces the notion that our food comes from the earth, from farms. Our family spent a day picking blackberries at Homestead Farm. I then met up with my canning buddy from pottery class. In addition to blackberry jam, we canned peach preserves and peach ginger chutney. Chutney may be used on baked brie, as a marinade for meat or vegetables, or in the crockpot with winter stew. We hope our jam lasts through fall. So far, most of it is consumed with fresh bread. As the little red says, “Oh joy of joys!”.